Emirates SkyCargo and Cargolux Airlines signed a Memorandum of Understanding (MoU) for a strategic operational partnership in air cargo transportation. This unique and ground breaking agreement, the first of its kind in the air cargo industry between a mainline airline and a specialised freighter operator, will allow cooperation between two carriers with complementary strengths and shared values for customer service excellence. The agreement was signed at the Air Cargo Europe event in Munich, Germany in the presence of Mr Francois Bausch, Luxembourg’s Minister of Sustainable Development & Infrastructure. Richard Forson, Cargolux President & CEO and Nabil Sultan, Emirates Divisional Senior Vice President, Cargo at the Air Cargo Europe event in Munich, Germany. 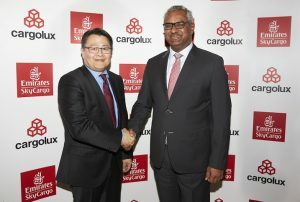 Emirates SkyCargo and Cargolux announce a strategic operational partnership in air cargo transportation. In addition to allowing both carriers to develop service offerings to customers, the operational cooperation will enable both parties to ensure best practices in cargo handling and transportation.